Does the City accept credit/debit cards as a payment option? Yes, Cochran City Hall office now accepts credit/debit cards as a payment option. There's a 2% service fee that will be applied during each transaction, and this percentage is also applied for online services.This service charge is determined by how much your ending balance is and the type of card that is used. Ex: Visa, Mastercard, Discover and American Express cards. To complete your payment, you will need your Account # & Online WIPP Pin #. Also, by checking the front of your billing statement in the top right hand corner of your billing statement or you can contact the City Hall office. Once, this transaction is completed, you should then receive a Confirmation/Transaction #. Does the City has a Return check fee? Yes, The City is authorized to charge a $40.00 fee for Return Checks. Can I make a payment through my Checking Account? Yes, Cochran City Hall has an Automatic Bank Draft Authorization form available for customers to complete providing a signature and a blank VOID check. After completing this form. The Automatic Bank Draft will be deducted from either your Checking or Savings account on the 10th of each month. This agreement will remain effective until customer decides to comes in the City Hall to request to terminate their Bank Draft Agreement. In order for the Automatic Bank Draft to STOP, all customers must complete the Termination form at least 15 days in advance before the next billing statement is generated for the following month. If an Automatic Bank Draft withdrawal is returned back to the City of Cochran as a result of Insufficent funds, then the City of Cochran will apply a return check fee of $40.00, and reverse the total that was flagged Insufficent on the customer Utility account. No, The City of Cochran does not accept payments over the phone. How can I determine the balance of my bill? If you're unsure of your balance, you can contact the City Hall front office, or you can look up your billing information, by logging onto our Online Payment Portal. Again, you will need your Account # & Online WIPP Pin # to review your Billing Statement. When are the City Utility Bills are mailed out? When is my bill due? What's the deadline to make a payment on my Utility Bill? All bills are due by the 10th of each month. If you failed to make a payment by the due date, then on the next business day, a 10% late penalty fee will be applied towards all City services. All City customers has an extra 10 days to make a payment on their utility bill. If you failed to make a payment by the 20th, then depending on which day the 21st falls on, is when Cut Off is scheduled for discontinuing all City services for non-payment. If customer have made an online payment on the morning of Cut Off day, then all customers are required to pay an additional $25 Re-Connect fee, along with providing a Confirmation/Transaction #. Why I have not received my billing statement yet? All bills are mailed by the 25th of the each month. If you have not received your bill in the mail, then please contact the City Hall office. Why my bill is so high? A high water/sewer bill may be the result of a leak from a broken faucet, toilet, pipes or a running water hose, excessive water usage, or a misread of the meter. Any leaks occurred inside of the residence home and is between the City water meter is the homeowners responsibility. If customer suspect their water meter being misread, then please contact the City Hall office. How can I receive assistance with setting up a Payment Agreement on my bill? All payment agreements are ONLY approved by the Utility Billing Clerk, the City Clerk and the City Manager. The City customer must stop by the City Hall and ask to speak to either representative before the 10th to avoid termination. Payment agreements are NOT accepted after City Services has been discontinued. If any City Customers needing additional help with making a payment on their bill, please contact our local civic/religious organizations for assistance or view the Local Resources for Utility Assistance. Does the City have a place to drop off payments after office hours? Yes, the City has a GRAY drop box located outside the of the City Hall building for payments. What are the Base water, sewer and garbage rates? 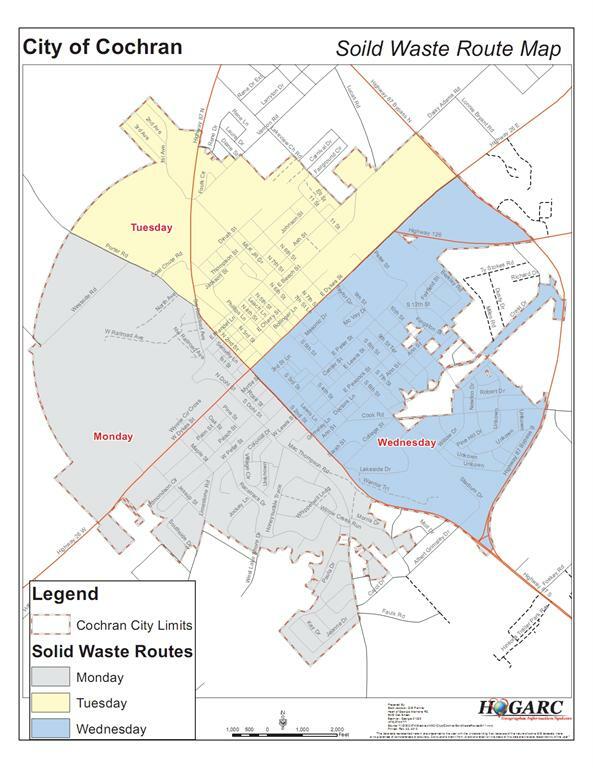 Does the City of Cochran City Hall has a Terms & Condition Form? Yes, please click here on Terms and Condition form. Are the meter readers reading my meter? Yes, all meters are read on a monthly basis. Why am I not being informed about Cut-off? Depending on which day the 21st falls on each month, is how we determined which day Cut off for Non-Payment will be held. Cut off for Non-Payment will ONLY be scheduled during the weekdays on Tuesday's, Wednesday's & Thursday's. Weekends is excluded. All Customer Service Clerks is assigned to complete courtesy calls to inform all City customers more about their City utilty bills before the 20th of each month. If you would like to be informed about your bill each month, please be sure to contact Cochran's City Hall office to update your contact information. What is the pick-up schedule for limbs and leaves in the City? The pick-up date schedule for yard debris are followed by the same day for garbage pick-up. If yard debris is not collected on the scheduled day. Please call the City Hall Office as soon as possible. Do I need to bag my yard debris? No, yard debris does not need to be bagged. Can someone from the City light my Gas pilot light? No, due to liability restraints our Natural Gas Public Workers can no longer enter inside the resident homes to light gas pilots. Can the City come on my property and clean my sewer? No, the City Public Workers are ONLY required to flush out the City's sewer line. What information do I need to set-up services? The City Customer Service Clerks are required to verify the identity of all individuals requesting City Services. Please click here for a Needing City Services form. What are the City Hall Office hours? The hours of operation for the City Hall is Monday-Friday from 8:30 a.m- 4:30 p.m.
Cochran's City Hall office is open every Wednesday Afternoon during our normal business hours 8:30 a.m-4:30 pm. CUT OFF FOR NON-PAYMENT DAY hours are 8:30 a.m-5 p.m.
How do I contact the City Hall? To contact the City Hall employees, please go to our Directory.